This Two Seater G55 Battery Powered Mercedes Benz Ride On is the ultimate style and speed accessory for drivers of the younger set! They'll be out to impress in this attractive Kid Mercedes Benz ride-on that travels up to 5mph, with ample room for two children. With forward & reverse gears, fake seat belts, a real working radio, speaker with mp3 hookup, and realistic sound effects, this Mercedes for kids is a blast to be inside. Covered in sleek silver with a chrome front grille, it's not bad to look at, either! 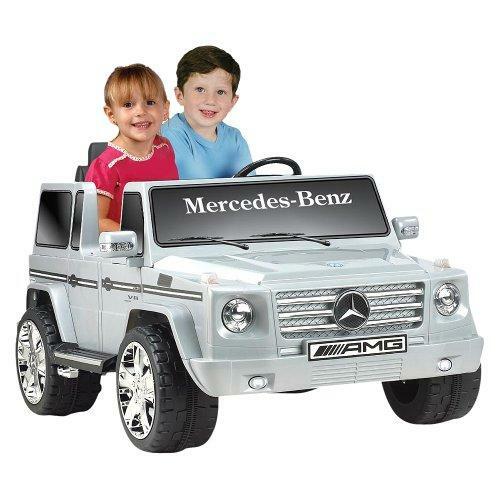 Whether or not you see a real Mercedes in your child's future, this 12V battery-powered Benz for ages 3+ is a great way to get them started on the road to fun and success. Battery charger included. Dimensions: 31" x 16" 52". Recommended total weight limit: 130 lbs. Availability: This National Products Mercedes Benz Ride On takes approximately 2 business days to leave the warehouse plus transit time. Note: This items ships GROUND only. It does not ship to APO/FPO addresses, PO Boxes, Alaska, or Hawaii.